This month is the City of Perth’s ‘Eat Drink Perth 2011’ festival with a whole range of events happening including hawker food markets, a butchers picnic, degustation dinners, gourmet food and wine tastings, cooking masterclasses, chef talks etc. 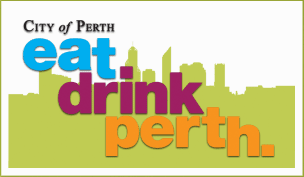 You can get all the details on events on the http://eatdrinkperth.showmeperth.com.au/ website, and you can also follow @eatdrinkperth on twitter (check the hashtag #eatdrinkperth) and 'like' Eat Drink Perth on Facebook. How do we eat and drink? We experience the flavour of food in our mouth and our appreciation of flavour also relies on our sense of smell. We also eat with our eyes. An important aspect of food consumption is the visual aspect - what you see. It’s a multisensory experience and the visual is the first stimuli received before the flavour of food is even tasted or smelt! I think that the visual experience of eating and drinking cannot be isolated from its wider context - the surrounding environment and everything that you see around you. What makes people want to go out eating and drinking in their city? What makes a city a city? I think that the cultural vibe that a city emits is important and the arts play a role in this by giving a city a bit of character. The visual environment of our city can enhance our enjoyment of going out to eat and drink. Would you rather be eating and drinking in a city with amazing street art around the place or a city with brown, grey walls everywhere (which would feel a bit lifeless). So to fully experience and appreciate Eat Drink Perth 2011, I encourage people to not only eat and drink around Perth but also ‘see’ this city. Take a stroll around the city and Northbridge while out at Eat Drink Perth events and check out all the amazing street art that has started popping up everywhere. Beautiful photos! A lot of Perth art gets over looked. Fortunately EatDrinkPerth is on the all encompassing PIAF/Fringe/Summer festival of stuff. This time of year is such a wonderful time for people to get out there, make new connections, develop old ones and reinvirogate their passion for this wonderful city. Thanks! I really love all the street art that has been popping up around Perth and I hope that people will go out and see it because it is helping to revitalise this city and bring it to life. I hope that the City of Perth can see that this is worth investing in and provide more spaces for Perth artists to create art. Great pics! There's also a mural on the wall next to City Farm, coming down the stairs from Claisebrook Train Station in East Perth. It changes regularly. Right now it's like a creepy Alice in Wonderland, previously it was a Mortal Kombat scene with the old favourites, Sub Zero, Scorpion and Raiden. Awesome advice. It's easy to forget the art work hidden away when you're trudging through the hot sun to get from point a to point b (hoping desperately that point b has air conditioning). what are the names of the artists that did all the art? also since when did Northbridge get coles? @ConorHoldtheBeef Thanks :) Hope to bump into you somewhere along point a to b. The weather is looking a lot more bearable this week but I think I may bring out a little fan with me to Eat Drink Perth events.